The easiest way to package full framework .NET applications from your continuous integration/automated build process is to use OctoPack. OctoPack adds a custom MSBuild target that hooks into the build process of your solution. When enabled, OctoPack will package your Windows Service and ASP.NET applications when MSBuild runs. This makes it easy to integrate OctoPack with your build server - as long as you can pass properties to MSBuild, you can use OctoPack. Please see this section for more details. OctoPack is built and maintained by the Octopus Deploy team, but it is also open source. You can view the OctoPack project on GitHub. Under the hood, OctoPack eventually calls good old nuget.exe pack to build the NuGet package, and nuget.exe push to publish the package (if so desired). OctoPack adds value because it understands .NET applications and uses that knowledge to build the right kind of package for each kind of .NET application. Did you know Octopus now supports other package types too? Now you can simply pack all the files you need straight into a specially named zip file, or any of the other supported package types, and Octopus will deploy it for you just like you'd expect. When OctoPack works for your situation, it's brilliant! However, if you find yourself wrestling with OctoPack, perhaps dropping the files you want deployed into a folder, and zipping it up for Octopus will turn out a lot simpler? This three minute video (with captions) will walk you through the process of installing and using OctoPack. OctoPack should only be installed on projects that you are going to deploy - that means the console application projects, Windows Service projects, and ASP.NET web applications. Unit tests, class libraries, and other supporting projects wouldn't be selected. A .nuspec file describes the contents of your NuGet package. OctoPack automatically creates one if you haven't provided one, by guessing some of the settings from your project. But you may wish to provide your own simple .nuspec file to your project. The file name should match the name of your C# project - for example, Sample.Web.nuspec if your ASP.NET project is named Sample.Web. The .nuspec file needs to be in the same directory as your .csproj file. Learn more about the NuSpec file format. Since OctoPack is built for .NET applications, with special knowledge about the types of applications you can build, it is smart enough to only package the files required to deploy them. If you are packaging a .NET application, OctoPack will automatically package all of the files in the build output directory for the project. In most cases this will be the bin, bin\Debug or bin\Release folder, depending on the build configuration and whether you have changed the build output directory for your project in Visual Studio. If you have customized the output directory and you have added a custom <files> element to your custom nuspec file, all paths you specify must be relative to the nuspec file's location. This means that for the binaries files that are being built by the project you will have to use some combination of ..\ style prefix to refer to the assemblies. For Windows Service or Console applications, and many Windows Forms or WPF applications, the build output directory contains everything you need to deploy your application. The example below shows a Windows Service called OctoFX.RateService.exe and all of the files required to run the application, including libraries and configuration files. The example below shows a web application called OctoFX.TradingWebsite and you can see that all the files required to host the web application have been packaged, including the contents of the bin folder and any files with Build Action: Content. OctoPack won't run web.config transformation files, because these will be run as part of the deployment instead. Make sure you set Build Action: Content for your config transform files (like web.Release.config) to ensure these files are packaged and used as part of your deployment. 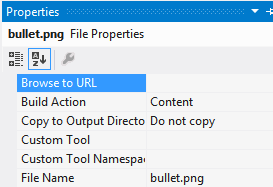 If you need to include other files in your package for deployment, use the Visual Studio properties panel to set the Copy to Output Directory attribute to Copy if newer or Copy always. These files will be copied to the build output directory when the project builds, and subsequently packaged by OctoPack. Did you know you can use XML Config Transforms on any XML files including the app.config file for Windows Service, Console, Windows Forms or WPF applications? Make sure the transform files are copied to the build output directory as part of your build, and the will be packaged by OctoPack so you can use them as part of the deployment. If the <files> section exists, OctoPack by default won't attempt to automatically add any extra files to your package, so you'll need to be explicit about which files you want to include. You can override this behavior with /p:OctoPackEnforceAddingFiles=true which will instruct OctoPack to package a combination of files using its conventions, and those defined by your <files> section. See the NuSpec documentation for more examples on how the <files> section of the .nuspec file is interpreted by nuget.exe. The command line, if you pass /p:OctoPackPackageVersion=<version> as an MSBuild parameter when building your project. If the assembly contains a GitVersionInformation type, the field GitVersionInformation.NuGetVersion is used. If you pass /p:OctoPackUseProductVersion=true as an MSBuild parameter, [assembly: AssemblyInformationalVersion] (AKA Assembly's product version) is used. If you pass /p:OctoPackUseFileVersion=true as an MSBuild parameter, [assembly: AssemblyFileVersion] (AKA Assembly's file version) is used. If the [assembly: AssemblyInformationalVersion] value is not valid, the [assembly: AssemblyFileVersion] is used. If the [assembly: AssemblyFileVersion] is the same as the [assembly: AssemblyInformationalVersion] (AKA ProductVersion), then we'll use the [assembly: AssemblyVersion] attribute in your AssemblyInfo.cs file. Otherwise we take the [assembly: AssemblyInformationalVersion]. During the build messages are output at the Normal msbuild logging level which may help diagnose version retrieval problems. OctoPack 3.4.0 to 3.4.2 used the official build of NuGet 3 to varying degrees and therefore do not preserve version numbers as described per below. NuGet 3 started removing leading zeros and the fourth digit if it is zero. These are affectionately known as "NuGet zero quirks" and can be surprising when working with tooling outside the NuGet ecosystem. We have made a choice to preserve the version as-is when working with Octopus tooling to create packages of any kind. Learn more about versioning in Octopus Deploy. To make this work for NuGet packages we have forked NuGet. msbuild MySolution.sln /t:Build /p:RunOctoPack=true "/p:OctoPackNuGetProperties=suffix=release;title=My Title;version=1.0.0;myname=Paul"
/p:OctoPackPublishPackageToFileShare=C:\MyPackages - copies the package to the path given. 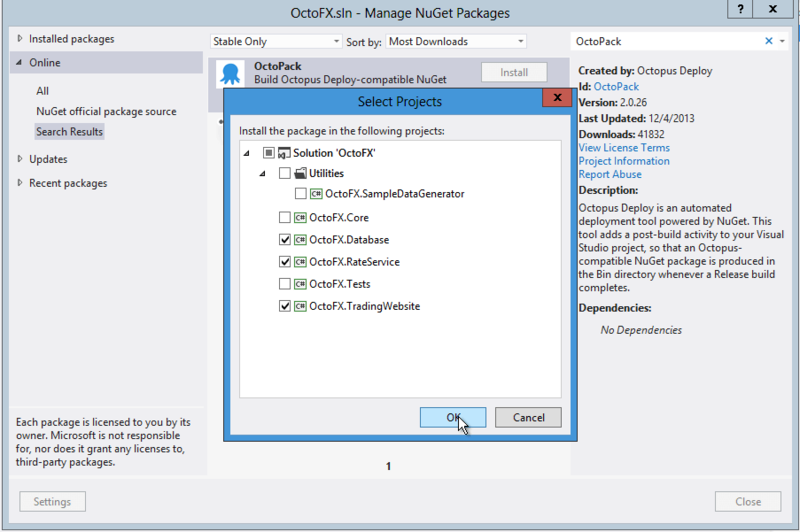 /p:OctoPackPublishPackageToHttp=http://my-nuget-server/api/v2/package - pushes the package to the NuGet server. /p:OctoPackPublishApiKey=ABCDEFGMYAPIKEY - API key to use when publishing. /p:OctoPackAppendProjectToFeed=true - Append the project name onto the feed so you can nest packages under folders on publish. /p:OctoPackAppendToPackageId=foo - Append the extra name to the package ID (e.g. for feature branch packages). MyApp.Foo.1.2.3.nupkg. Want to Use the Octopus Built-in Repository? Octopus provides a built-in package repository for your deployment packages. The Octopus built-in repository is generally the best choice for deployment packages because it offers better performance and most suitable retention policies. /p:OctoPackPublishPackageToHttp=http://your.octopusserver.com/nuget/packages - this is the URL to your Octopus Server noting the /nuget/packages path. /p:OctoPackPublishApiKey=API-ABCDEFGMYAPIKEY - the Octopus API key you you want to use for pushing packages noting these security considerations. Read more about pushing packages to the Octopus built-in repository. In addition to the common arguments above, OctoPack has a number of other parameters. The full list is documented in the table below. RunOctoPack True Set to True for OctoPack to run and create packages during the build. Default: OctoPack won't run. OctoPackPackageVersion 1.0.0 Version number of the NuGet package. By default, OctoPack gets the version from your assembly version attributes. Set this parameter to use an explicit version number. OctoPackAppConfigFileOverride Foo.config When packaging a project called YourApp, containing a file named App.config, OctoPack will automatically ignore it, and instead look for YourApp.exe.config. Provide this setting to have OctoPack select your specified config file, instead. 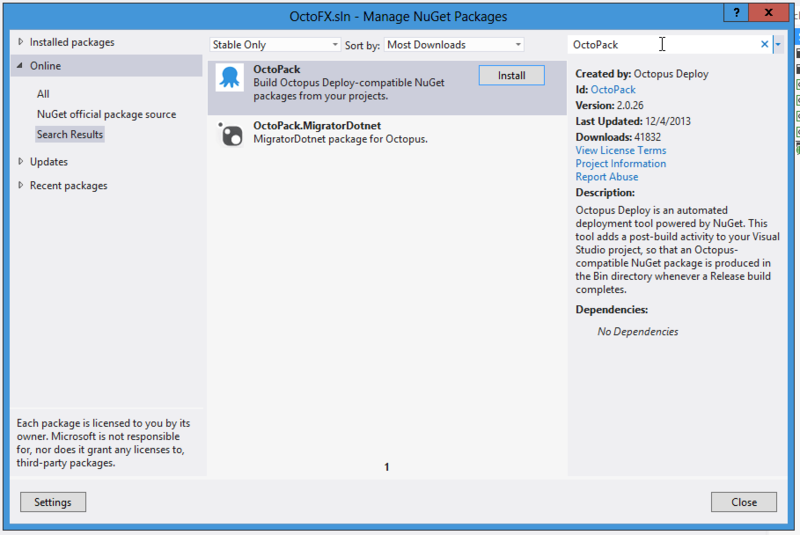 OctoPackAppendToPackageId Release A fragment that will be appended to the NuGet package ID, allowing you to create different NuGet packages depending on the build configuration. E.g., if the ID element in the NuSpec is set to "MyApp", and this parameter is set to "Release", the final package ID will be "MyApp.Release". OctoPackAppendToVersion beta025 Define a pre-release tag to be appended to the end of your package version. OctoPackEnforceAddingFiles True By default, when your NuSpec file has a <files> element, OctoPack won't automatically add any of the other files that it would usually add to the package. Set this parameter to true to force OctoPack to add all the files it would normally add. OctoPackIgnoreNonRootScripts True Octopus Deploy only calls Deploy.ps1 files etc., that are at the root of the NuGet package. If your project emits Deploy.ps1 files that are not at the root, OctoPack will usually warn you when packaging these. Set this parameter to true to suppress the warning. OctoPackIncludeTypeScriptSourceFiles True If your project has TypeScript files, OctoPack will usually package the corresponding .js file produced by the TypeScript compiler, instead of the .ts file. Set this parameter to true to force OctoPack to package the .ts file instead. OctoPackNuGetArguments -NoDefaultExcludes Use this parameter to specify additional command line parameters that will be passed to NuGet.exe pack. 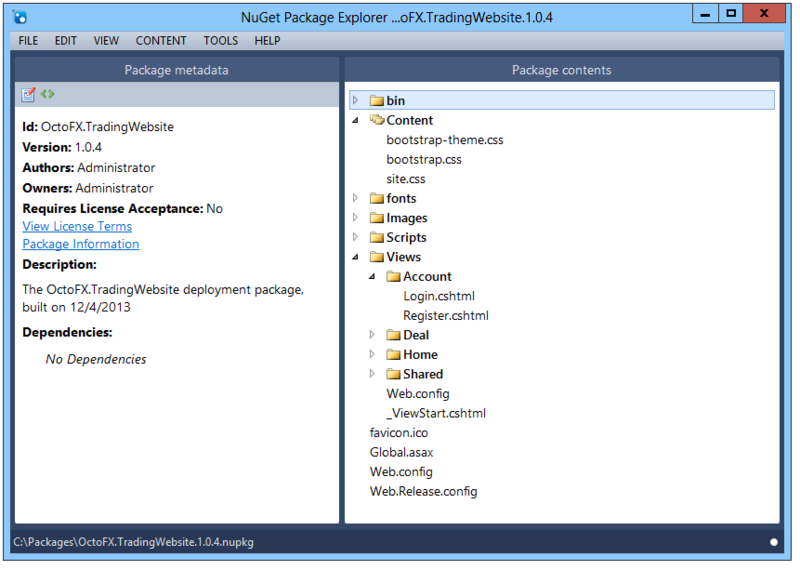 See the NuGet pack command description. 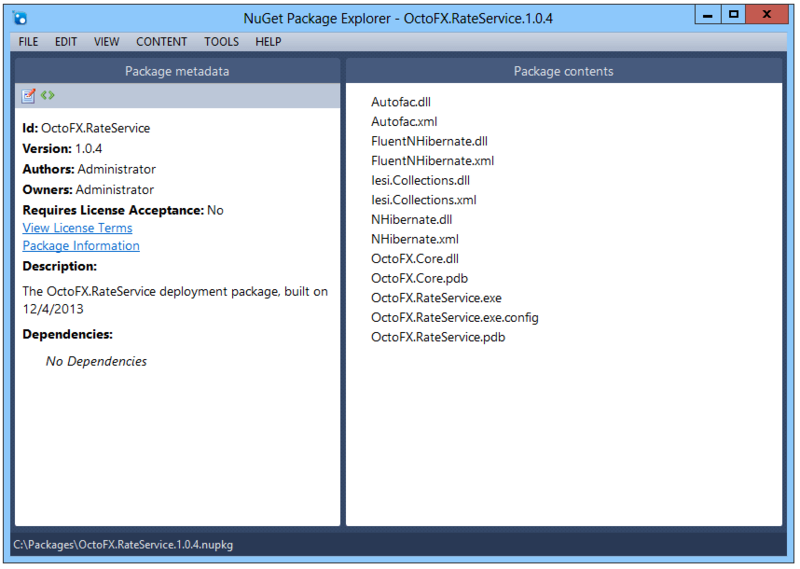 OctoPackNuGetExePath C:\Tools\NuGet.exe OctoPack comes with a bundled version of NuGet.exe. Use this parameter to force OctoPack to use a different NuGet.exe instead. OctoPackNuGetProperties foo=bar;baz=bing If you use replacement tokens in your NuSpec file (e.g., $foo$, $bar$, $version$, etc. ), this parameter allows you to set the value for those tokens. See the section above on replacement tokens, and see the NuSpec reference for details on replacement tokens. OctoPackNuGetPushProperties -Timeout 500 Additional arguments that will be passed to NuGet.exe push if you are pushing to an HTTP/HTTPS NuGet repository. See the NuGet push command description. OctoPackNuSpecFileName MyApp.nuspec The NuSpec file to use. Defaults to "<C#/VB project name>.nuspec". If the file doesn't exist, OctoPack generates a NuSpec based on your project metadata. OctoPackPublishPackagesToTeamCity False By default, if OctoPack detects that the build is running under TeamCity, the NuGet package that is produced is registered as an artifact in TeamCity. Use this parameter to suppress this behavior. OctoPackPublishPackageToHttp http://my-nuget-server/api/v2/package OctoPack can publish packages to a HTTP/HTTPS NuGet repository (or the Octopus built-in repository) after packaging. OctoPackReleaseNotesFile myreleasenotes.txt Use this parameter to have the package release notes read from a file. Sometimes OctoPack doesn't work the way you expected it to, or perhaps you are having trouble configuring your .nuspec file. Here are some steps to help you diagnose what is going wrong, and fix the problem. The /p:RunOctoPack=true argument configures OctoPack to run as part of the build process The /fl argument configures msbuild.exe to write the output to a log file which will usually look like msbuild.log. Refer to the MSBuild documentation for more details. Note: You may need to change some of these parameters to match the process you are using on your build server. Take a look at the build server logs and try to emulate the process as closely as possible. Using "GetAssemblyVersionInfo" task from assembly "c:\dev\MyApplication\source\packages\OctoPack.3.0.42\tools\OctoPack.Tasks.dll". Using "CreateOctoPackPackage" task from assembly "c:\dev\MyApplication\source\packages\OctoPack.3.0.42\tools\OctoPack.Tasks.dll". OctoPack: Attempting to build package from 'MyApplication.Web.nuspec'. OctoPack: Successfully created package 'c:\dev\MyApplication\source\MyApplication.Web\obj\octopacked\MyApplication.Web.0.0.0.0.nupkg'. Copying file from "c:\dev\MyApplication\source\MyApplication.Web\obj\octopacked\MyApplication.Web.0.0.0.0.nupkg" to "..\..\artifacts\MyApplication.Web.0.0.0.0.nupkg". Task "Message" skipped, due to false condition; ('$(OctoPackPublishPackageToHttp)' != '') was evaluated as ('' != ''). Task "Exec" skipped, due to false condition; ('$(OctoPackPublishPackageToHttp)' != '') was evaluated as ('' != ''). Done building target "OctoPack" in project "MyApplication.Web.csproj". If you cannot see any OctoPack-related log messages, perhaps OctoPack isn't installed into your project(s) correctly? Try completely uninstalling OctoPack and installing it again. If OctoPack is running but your files are not being packed correctly, see if the file is mentioned in the build log. Files that are copied to the build output directory will be included in the package. Take a look at the contents of your build output directory and compare that with the messages in the build log. For web applications, files that are configured with the Visual Studio property Build Action: Content will be included in the package. If you have specified the <files> element in a custom .nuspec file, perhaps you need to add the /p:OctoPackEnforceAddingFiles=true MSBuild argument as discussed above? If you have specified the <files> element in a custom .nuspec file, perhaps you need to experiment with some different combinations of include and exclude? OctoPack does not support .NET Core projects. If you are using .NET Core for class libraries, we recommend using dotnet pack from Microsoft. If you are using .NET Core for web applications, we recommend publishing to a folder and then using Octo.exe pack, as described in the "Publishing and Packing the Website" section of the Deploying ASP.NET Core Web Applications documentation.